To make sure you are comfortable before you come for treatment, and also ensure you have everything you need, here are a few helpful notes. If you have a question you cannot find the answer to, please feel free to contact us. Paul or Jackie will take a history of your condition and ask you about any other medical problems you have or have had in the past (they may be relevant). Next you will be examined. Generally you will be asked to do a movement or task to reproduce your symptoms. For example, if you have a problem with your feet, knees, hips or lower back, we usually ask to watch you walk. A great deal can be learned, just watching you get up from a chair and walk a few steps. After this we will assess specific areas (e.g. knee), check the range of movement, the stability, look for swelling, temperature changes and identify the structures which are causing your pain. With the information gained from both your history and physical examination we will provide you with a diagnosis. Having ascertained the cause of your problem, we will explain your diagnosis and prognosis and treatment can start if you are happy to proceed. Treatment is rarely done in isolation, where possible we give you the opportunity to help yourself with exercise, posture correction etc. No, but if you have medical insurance and wish to make a claim for your treatment, it is likely that your insurers will ask for a doctor's referral. Please check by phoning your insurance company help line. We are recognised by all Insurance companies, but your individual policy may have restrictions, therefore we advise you check with your insurers before booking treatment. Not usually but some things can be useful. If for instance you are a runner your therapist can learn a lot by looking at the way your running shoes wear and the support they give you. If you have relevant x-rays, they may be useful in assessing your condition. If you were fit enough to drive to us, you should be at least as fit to drive home. This varies enormously. Patients who refer themselves to us soon after their injury, particularly with acute back or neck problems need an average of only one to two treatments. 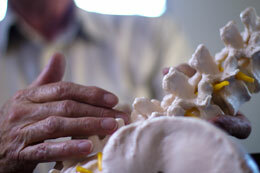 Treatment and rehabilitation of a more long standing problem typically runs at ten to twelve visits. Patients with multiple problems and severe whiplash will probably require more treatment. What is the difference between physiotherapists osteopaths and chiropracters? All three professions treat you using joint mobilisation and manipulative techniques (manual therapy). Physiotherapists use a holistic approach looking at the neuromusculoskeletal (nerves, muscle and joints) system as a whole placing great emphasis on the restoration of normal function of all of these structures. We teach you how best to optimise your rate and level of recovery and also to minimize the chance of future recurrence. Your normal day clothes will be fine.